See the discolouration/loss of pigmentation? What is the bump about an inch out from my mouth and the other smaller one on my cheek bone? 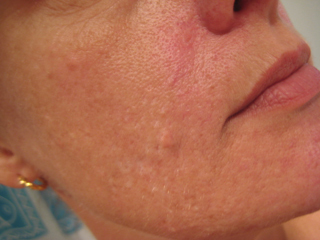 Hey, you might benefit from microdermabrasion (I've had it done regularly for the past 8 years) ...your scarring isn't bad at all, but the treatment will help smooth your skin out, minus the downtime associated with more radical treatments. As for the white areas, I'm not sure what can be done about that......maybe some kind of laser treatment?